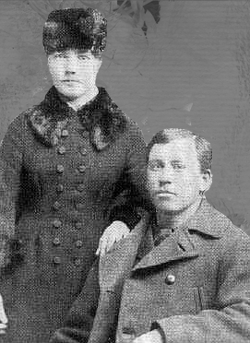 Typical of the middle of February when it is -23 before the windchill in Toronto like it is today, always makes me think about The Long Winter where the Ingalls family and the entire town of DeSmet survive one of the hardest and longest winters to be recorded. Six months of snow. No supplies. The family is left to twist hay to feed the fire and grind seeds to make bread. 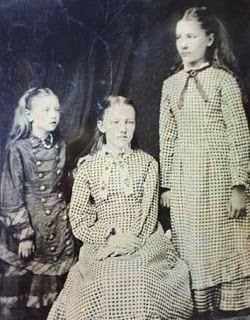 During my last re-reading, the image of the three girls kept coming to mind. I believe this photo is supposedly taken shortly after the long winter. You can see how close to the brink of starvation they were -particularly Carrie. It is a survival story with Almanzo and Cap Garland saving the day. It love re-reading these novels, because each time I remember, or see, something new. In particular how Laura appears quite clueless about what Almanzo is doing. She seems to be more interested in the horses than the man…although it is possible that is just an excuse she tells herself. Also, we can only see Almanzo through what he says and does because Wilder keeps everything in Laura’s point of view. One of my favourite moments is when Laura and Almanzo are riding in the lazy-back buggy and Almanzo puts his arm across the back of the buggy. Wilder writes: “He was not exactly hugging Laura, but his arm was against her shoulders. She shrugged, but his arm did not move away.” (166). Clearly not sure what to do, and probably feeling uncomfortable, she leans forward and shakes the buggy whip causing the horses to bolt. We can see what he’s trying to do and I felt kind of sorry for him. For even if he was being chivalrous before, he clearly had an agenda once he started taking her out. Whether Laura knew it or not. This is also the moment where things seem to shift for the two of them. Manly starts talking. But here is the other thing about Manly, he appreciates Laura’s independent spirit. Right after this incident he says to her, “You’re independent, aren’t you?” and her positive response doesn’t scare him away. It actually, seems to have the opposite effect for that is when he begins to open up to her… Or, break the awkward silence. He is also completely comfortable with Laura’s request for removing the word “obey” from the vows. “I do not think I could obey anybody against my better judgement,” she says. “I’d never expect you to.” he says. (270) He also tells her at one point that no man would want that in a wife anyway. And, given his openness in having Laura help with training the horses, it is pretty clear to me anyway, that he wanted a partner in life. As Laura tells Mary, “we seem to belong together.” They work well together. Perhaps it is because he was considerably older by the time he decides to “settle down” he had a more worldly – well worldy for the period – of what he wanted in a wife? Almanzo is also the romantic in the relationship – at least in that “farmer boy” kind of way. On their wedding day, he picks Laura up with the original team, Prince and Lady, that he drove in the early days of their courtship: “Prince and Lady started this,” he says, “So I thought they’d like to bring us home.” (284). He also builds Laura a pantry full of little drawers for all of her spices. “Like your pantry?” he asks. I kind of imagine him standing there blushing ever-so-slightly. And then he shows her around the farm as if to say, “This is your house, do you like it?” A slight modern version of this might be the guy who makes you a playlist with all of your favourite hits on it. In her book, Shelf Discovery Lizzie Skurnick has a chapter dedicated to Farmer Boy. 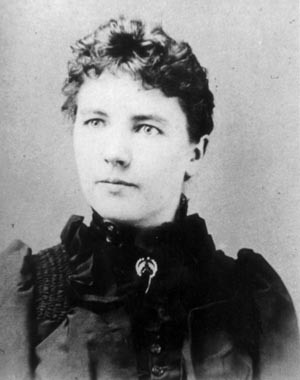 She says: “…but something of that old affection for one’s husband must transfer, like osmosis, to the reader…” (40). And, I cannot help but think that this is one of the reasons why we love Almanzo so much when we read about him – it is because he was loved. I take that back. I think in the end Laura was a romantic. Farmer Boy. The Long Winter. 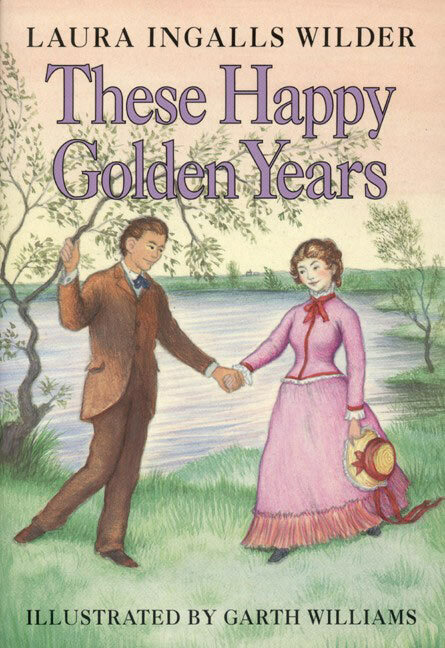 These Happy Golden Years. One gigantic love letter. 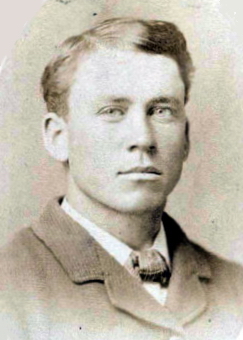 Today is Almanzo Wilder’s 158th birthday. Happy Birthday, Manly! You’ve never been more popular. *Note: This blog post has been updated from one previous written on February 11, 2011. This entry was posted in Authors, Children's Literature, Inspiration, Laura Ingalls Wilder, Literary Book Boyfriends, Writing and tagged Almanzo Wilder, book boyfriends, Farmer Boy, laura ingalls wilder, Little House books, Little House Series, Lizzie Skurnick, Shelf Discovery, The Long Winter, These Happy Golden Years, Writing process. Bookmark the permalink. Isn't it great re-reading old favs and discovering there is so much more there?You've inspired me – I'm going to have to read Farmer Boy. LOVE LOVE LOVE this!You know that I've been reading the books too, only in backwards order. I real never tire of the love story. Ok, Mel… I'm going to have to haul out my copies to reread. Great blog and also so appropriate for Valentine's Day! Thanks everyone. I'm so glad that it has inspired some re-reading and you enjoyed the post.